You know you should be meditating, so what’s stopping you? This entertaining and enlightening book by the founder of Ziva Meditation—the favorite training for high achievers—will finally take meditation mainstream. In our high-stress, overworked lives, we think the answer to accomplishing more is to do more. But the best advantage we can give ourselves is to take a mental break—to spend a few minutes of the day giving the body and brain rest. Did you know that a brief meditation can offer rest that’s five times deeper than sleep? When you make time to practice the Z Technique this book teaches, you’ll actually be more productive than if you took an hour-and-a-half nap or had a cup of coffee. 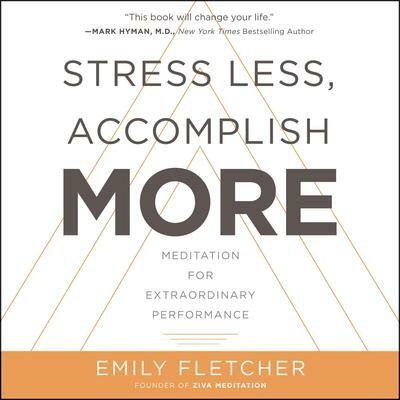 A leading expert in meditation for high performance, Emily Fletcher has taught meditation at numerous global corporations, including Google, Barclays Bank, and Viacom, to help their employees improve their focus and increase their productivity levels. With Stress Less, Accomplish More, anyone can get the benefits of her 15-minute twice-daily plan. Emily specifically developed the Z Technique for working people with busy lives. Now, you can learn to recharge anywhere, anytime—at home or at your desk. All you need is a few minutes and a chair (no apps, incense, or finger cymbals required). This is not just another meditation book. 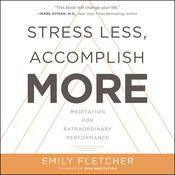 In Stress Less, Accomplish More, Emily teaches a powerful trifecta of Mindfulness, Meditation, and Manifesting to improve your personal and professional performance, clarity, health, and sleep. You’ll learn how to cultivate Mindfulness through brief but powerful exercises that will help you stop wasting time stressing. Plus, you’ll get Manifesting tools to help you get crystal clear on your personal and professional goals for the future. Filled with fascinating real-life transformations, interactive exercises, and practical knowledge, Stress Less, Accomplish More introduces you to a revelatory daily practice and shows you how to make it work for your modern life.